The Sharks signed forward Brandon Bollig to a two-way contract Tuesday morning, and who better to fill the void left by our dear-departed goals named Patrick Marleau? Bollig spent the 2016-17 season with the AHL’s Stockton Heat after clearing waivers from the Calgary Flames in October. One wonders, then, what kind of impact Bollig is expected to have on a Sharks team whose window is closing rapidly. 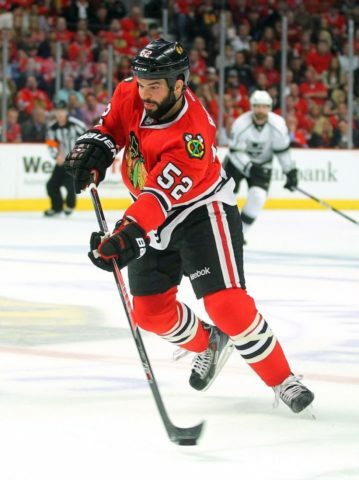 An undrafted player, Bollig was signed by the Chicago Blackhawks in 2010 after playing two years for St. Lawrence University. He made his NHL début in 2012, and went on to score 16 points (eight goals, eight assists) in 125 regular-season games and 24 playoff games over the course of three seasons, capturing a Stanley Cup with the team in 2013. A victim of the Blackhawks’ seemingly annual cap crunch bonanza, Bollig was traded to the Calgary Flames in 2014, where he played 127 games over two seasons, accruing 11 points over that span. A frequent healthy scratch, it was unsurprising that Bolling cleared waivers and was sent to the Flames’ AHL franchise, where he scored 23 points, matching his career regular-season NHL production in 65 AHL games; the rest is history. Known for his toughness, Bollig has 467 penalty minutes in 241 NHL games, to go along with his 27 points. That’s a penalty-minutes-to-points ratio of just over 17 to 1, for you math majors at home. In a league that seems to be consistently moving away from the role of enforcers, Jim Rutherford’s recent moves notwithstanding, the Bollig signing is puzzling at best. Hopefully, Bollig is primarily meant to be an AHL player in San José. After the Barracuda’s heartbreaking loss to the Grand Rapids Griffins in the AHL’s Western Conference Final this year, the AHL club is likely looking to bolster its roster for another run. Further, after the Sharks chose not to extend a qualifying offer to restricted free agent Nikita Jevpalovs, after Buddy Robinson signed a deal with the Winnipeg Jets on July 1, and after breakout seasons from young forwards Timo Meier, Kevin Labanc, and Marcus Sorensen, the Barracuda’s winger cupboard doth runneth empty. Maybe Bollig’s goal in Game 3 of the Heat’s first-round series against San José turned more heads in the Barracuda front office than in the stands, and they champed at the proverbial bit to get him in teal. This is concerning, coming from a team that has recently made room in the NHL lineup for John Scott, Adam Burish, Mike Brown, and Micheal Haley, the latter two under current head coach Pete Deboer. The loss of Patrick Marleau to the Maple Leafs via free agency still stings, but it also opened up an opportunity for some of the aforementioned younger players to earn playing time. Timo Meier, the ninth overall pick in the 2015 NHL Entry Draft, showed flashes of brilliance in limited NHL action in 2016-17, winning puck battles in the corners, dancing around defenders, and placing fourth in the entire NHL in even strength shots per 60 minutes among players with at least 30 games played. One has to assume that, with ample ice time, Meier will improve on his well-below-average 5.24 shooting percentage and be a legitimate scoring threat. Right wing Kevin Labanc had a similarly strong season. After leading the OHL in points in 2015-16, Labanc made his début with the NHL count, scoring 20 points in 55 games. Never looking out-of-place, Labanc plays with poise and confidence uncommon in first-year players. 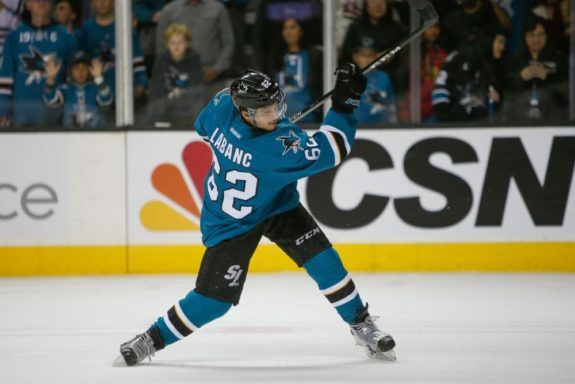 Labanc is a strong option to fill the gap on the power play left by Marleau’s departure, as his vision and passing ability have been lauded since his junior days. Unfortunately, the current Sharks coaching staff has a proven track record of prioritizing grit and tenacity over skilled young players. In 2015-16, Mike Brown played 44 games, recording three points and 63 penalty minutes, while promising prospect Barclay Goodrow scored as many points in 14 contests. In 2016-17, Haley (a more skilled than average enforcer, to be fair) played 58 games, compared to Labanc’s 55, Meier’s 34, and Sorensen’s 19. The Sharks seemingly want to play with an enforcer, and only one enforcer. It should be said that Haley is a bit of an outlier among these players. Haley is a skilled enforcer, an effective battler in corners, and a better-than-average passer, placing 48th in the league in primary assists per 60 minutes. However, his role on the team was an old-fashioned one, averaging nine minutes of ice time per night, and tallying 128 penalty minutes, including 16 fighting majors and one suspension. Wilson clearly isn’t bringing in Bollig to replace Haley. If that were the plan, he would have just kept Haley, who recently signed with the Florida Panthers, so what is the strategy here? Was Haley too good at hockey, but not violent enough to suit the Sharks’ needs? Did the rampage of brutal headshots and cheap stick work named Zack Kassian in the 2017 postseason put such a scare into San Jose’s front office that they chose to replace a decent fourth liner with a bruiser with playoff experience, and rings in the room? Did Bollig win everyone over with his Patrick Kane parody youtube video? Whatever the reason, the NHL is moving away from fear and violence, and towards skill and speed. This signing moves the Sharks in the opposite direction.